Israeli soldiers abducted, on Sunday at dawn, two young Palestinian men in Jenin refugee camp, in the northern West Bank governorate of Jenin. Media sources said the soldiers abducted Saleh Adel Bani Gharra and Ahmad Ibrahim Abu Ragha, after stopping them at a roadblock, east of Jenin. They added that the soldiers installed the roadblock on the bypass road, east of Jenin city, before abducting the two young man, in addition to confiscating their cars. In addition, the soldiers invaded and ransacked the home of a former political prisoner, identified as Salim al-Khouli, in Azzoun town, east of Qalqilia, in northern West Bank. 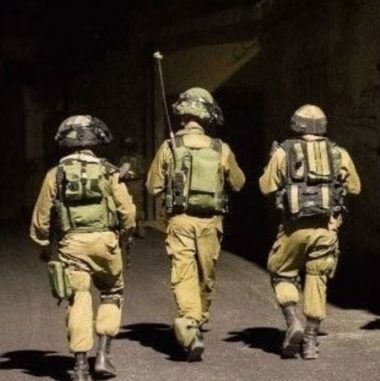 The soldiers also invaded Amouria, al-Lubban ash-Sharqiya and Azzoun towns, near the northern West Bank city of Nablus, before storming many shops, and confiscated surveillance equipment. In related news, the soldiers abducted the secretary of Fateh Movement in occupied East Jerusalem, and a Palestinian teen in the al-Khader town, south of Bethlehem, in the West Bank.